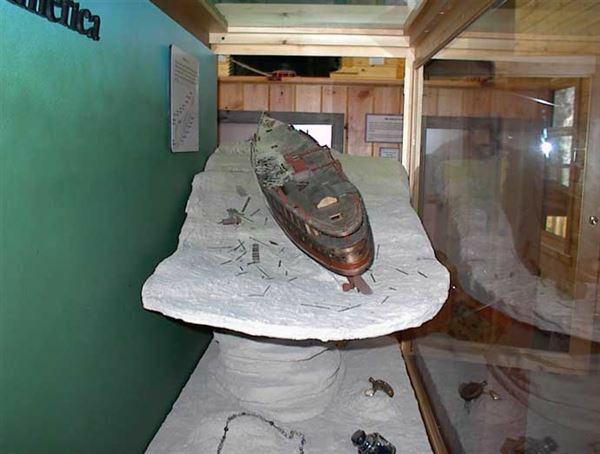 The Isle Royale shipwreck display project began in 1998 after our 1997 construction project uncovered numerous artifacts buried in the silt of the wreck. We approached the park service about the possibility of constructing an artifact display for the Windigo Ranger Station. The park was completing the construction of a new visitor center at the time and they wanted a shipwreck display and model of a shipwreck site. We worked out the plans for a set of back to back cabinets that would model the shipwrecks of the south end of Isle Royale. 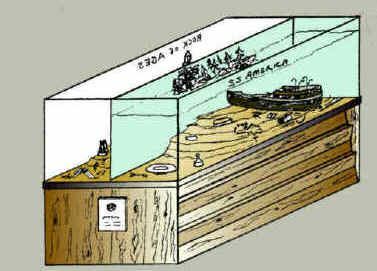 One display would be of the three shipwrecks on Rock of Ages Shoal and the other would be an underwater scene of the shipwreck America with some of the recovered artifacts arranged around the model "as if they were laying in the silt." Our grant proposal to the National Maritime Initiative and was declined, though we made it to the final round. We then turned to our members to become donors to fund the project and obtained adequate support to do the project. Our original thought was that we could complete the project in two years. We missed that schedule by quite a bit but the display has been evolving each year and should be complete in the summer of 2005. Below are the highlights of this continuing project. The initial concept proposal was based on the above drawing. 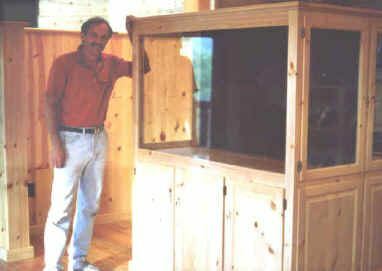 In 1999, we delivered two beautiful knotty pine display cabinets built by Steve Petschel. 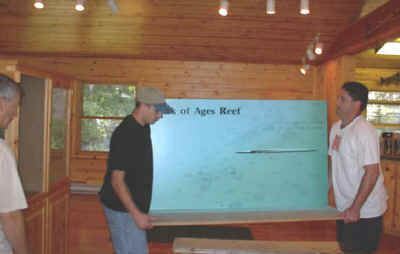 In 2000, we installed a mock-up of the final Rock of Ages Reef Display. The underwater topography was built up of styrofoam and plaster. In 2002, we delivered the display backdrop and the completed Chisholm & Cumberland and Rock of Ages Lighthouse models. The near complete display of the Chisholm & Cumberland site and Rock of Ages Lighthouse with interpretive background. The model of the George M Cox which will go to the left of the Chisholm & Cumberland model will be delivered in 2006. 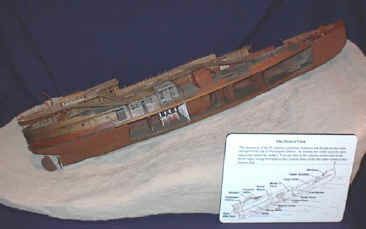 A closer view of the model of the stern and engine of the Henry Chisholm as it lays on the bottom in 150 feet of water built to scale about one inch tall. 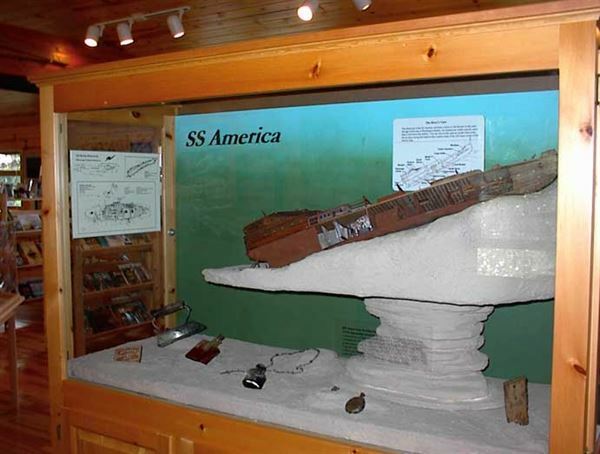 In 2000, we also mocked up the layout of the America side of the display featuring the model of the shipwreck on the pedestal with the conserved artifacts arranged below. 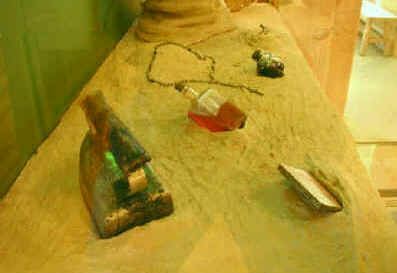 An old electric iron, cigarette case, bottle of perfume, bottle of ink, a rosary, and a gold ring are some of the artifacts recovered from the SS America on display in our shipwreck display at Windigo Visitor Center. It took two years to complete the model and a year to complete the underwater topography and display graphics, but in September 2002 we delivered the final product. 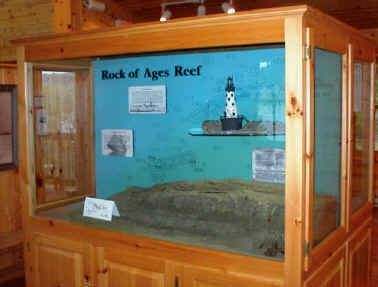 It is a model of the underwater scene of the Henry Chisholm and Cumberland shipwrecks site and a model of the Rock of Ages Lighthouse including interpretive photographs and verbiage. 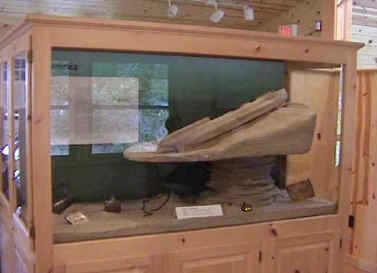 The display is one of the centerpieces of the Windigo Visitor Center at Isle Royale National Park. A model of the George M. Cox site will be added in 2006. Tom Jesperg, a local railroad modeler, did the lighthouse model. Ken Merryman did the two shipwreck models and Cari and Ken Merryman did the underwater topography. The goal for 2005 is to complete the project including the open-sided America model and display and the Cox model and topography display. To say we underestimated the amount of time and work to complete this project is probably itself an understatement, but we have continued to deliver the parts of the display as they have been completed. Our thanks to the financial donors for your support and patience. 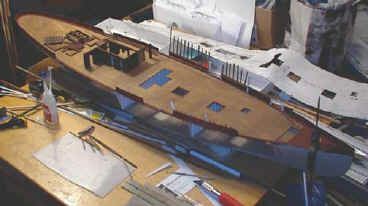 Below are photographs chronicling the progress on the open-sided SS America Shipwreck Model by modeler Ken Merryman. 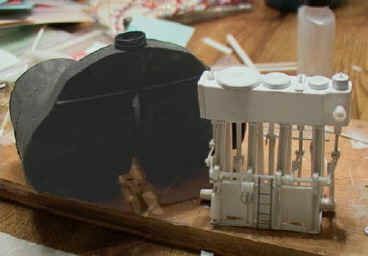 The model started with a wood hull carved out of basswood then one side was removed to expose lower cabins. 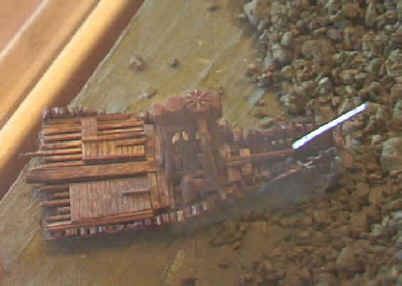 The deck and steel sides were added probably in the same sequence as the ship was actually built. 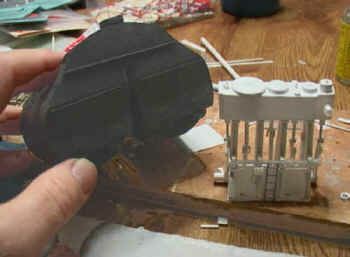 Although they will be mostly obscured, the interior cabins were built before the outside cabin walls. The outer cabins walls were added and the upper decks fashioned. Port Side, Boat Deck, with skylight in place but not complete. 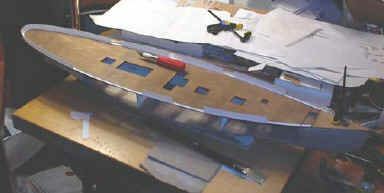 The plating lines were added to the hull using masking and modeling putty. 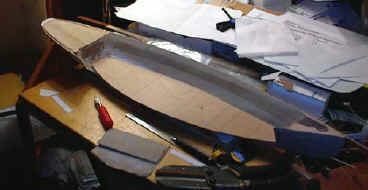 The steel parts are modeled in polystyrene plastic. The engine, boiler and boiler plenum are ready for final finishing. 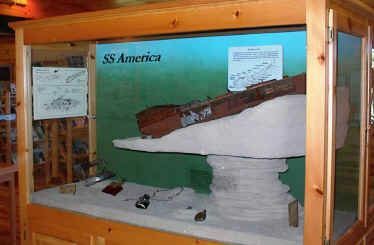 America model display for 2004 Dive Into the Past Show. 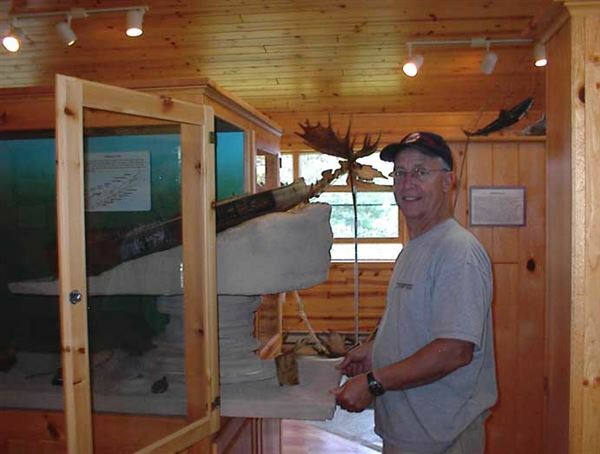 The mostly complete America model was delivered to the Windigo Visitor Center in July 2004. It was brought home for the last time over the winter of 2004 to add some final details and to display at Gales of November and Dive Into the Past, but will be left at Windigo in 2005 for the foreseeable future. 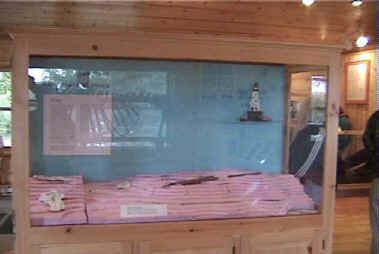 The completed America model was delivered to the Windigo Visitor Center on July 15, 2005. Now only one more text board remains to be done to complete the SS America shipwreck display. America Display Project Chairman and modeler Ken Merryman installs the model into the display for the final time. The model and pedestal were transported to the island aboard his boat on one of his scuba charters. 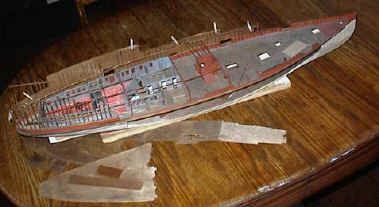 A stern view of the model showing the debris scattered on the bottom surrounding the wreck and the algae covering the bow and forward portion of the shipwreck. The model serves not only an an educational and interpretive purpose, it also accurately documents the current state of the wreck.